The PCI Express Add on Card supports RS232 serial connections through an octopus cable enabling 8 additional COM ports to your system through the PCI Bus. The PCI card itself uses a 62-pin cable connector to enable the 8 serial ports. Uses 62-pin connector to secure the octopus cable to the PCI card. 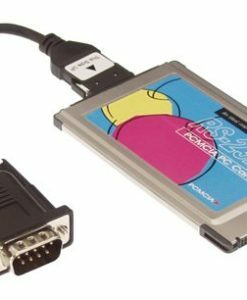 Supports 8 separate RS232 Serial connections. The PCIe-8RS2 PCI Express 8-port serial I/O card is a plug & play high-speed serial I/O expansion card for PCI Express bus. The PCIe 8-port serial I/O card design utilizes the Exar XR17V358 PCI Express to UART chip. The PCIe add on card supports high-speed data rate up to 921.6 Kbps. Each serial port is compatible with 16550 UART, with enhanced feature of 256-byte TX and RX FIFO buffer for higher performance.